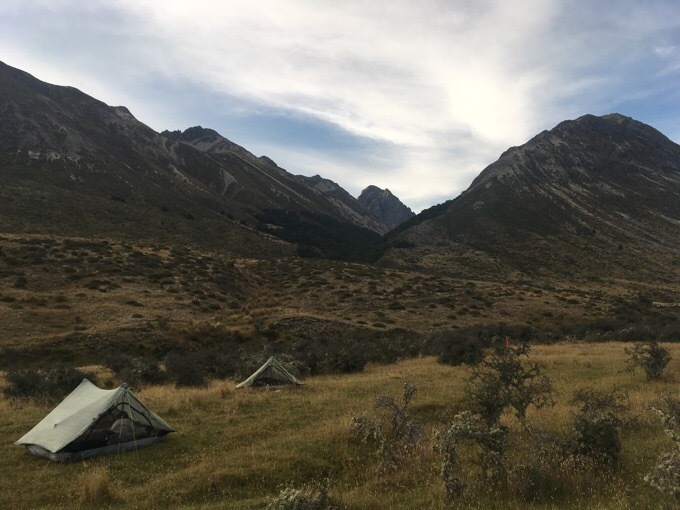 Day 112: Unpaused, Back On The Te Araroa! 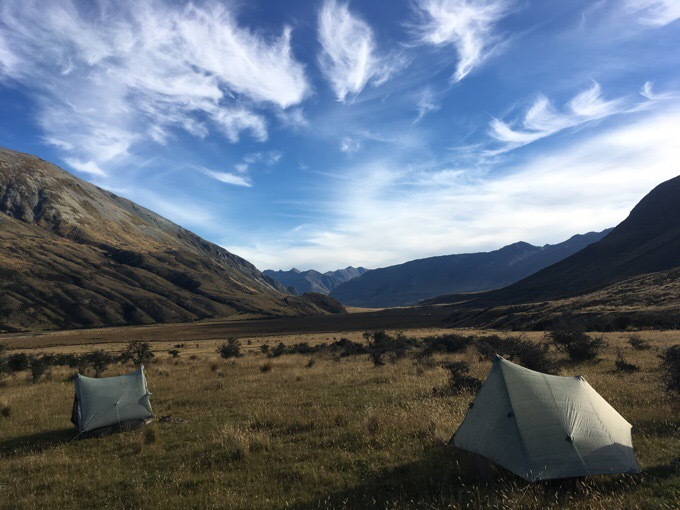 We finished up our final side trip and got back on the Te Araroa today! We started walking after 7:30am to do 9mi/15km on the Caples Track. It was pretty dark in the forest while we packed up. We are noticing the sun is coming up later and the days are getting shorter. 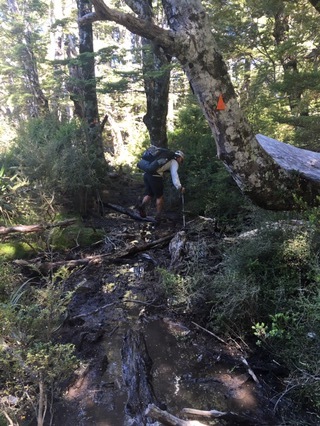 The Caples Track was a total forest cruise and then along the Caples River to where it intersects the Greenstone River. Early morning fog along the Caples. 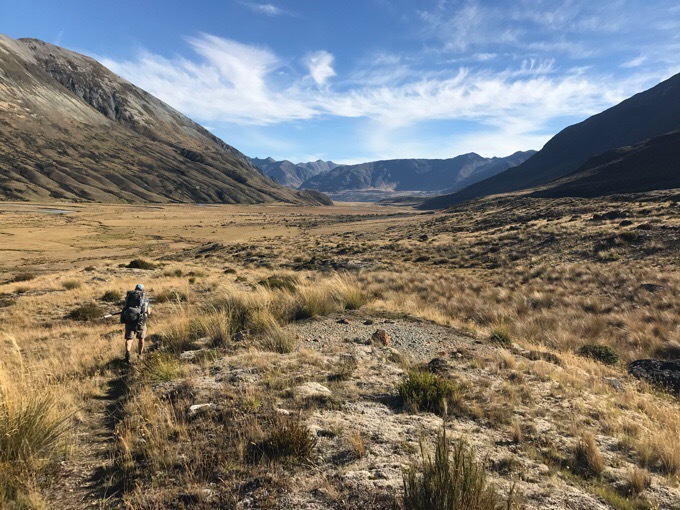 That intersection of the Caples and Greenstone is where we were back on the Te Araroa and on the popular Greenstone Track. Hikers that don’t do the Routeburn to Caples to get on the TA have to take a shuttle or ferry to get around Lake Wakatipu from Queenstown. 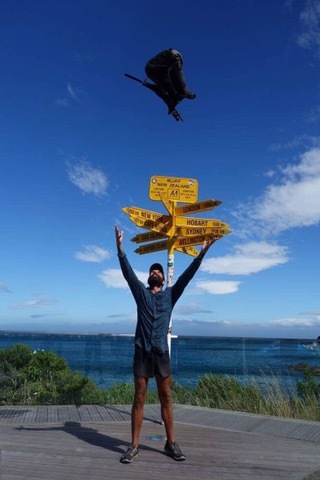 We were pretty stoked to be back on the TA. It’s been 11 days since we hit the pause button in Queenstown to do all the side trips. In that time, we did a ton, and it turned out to be a really efficient way to do all the things we both had planned to do after the hike. I recommend everything we did and that hikers take advantage of good weather if it’s clear when you go through. 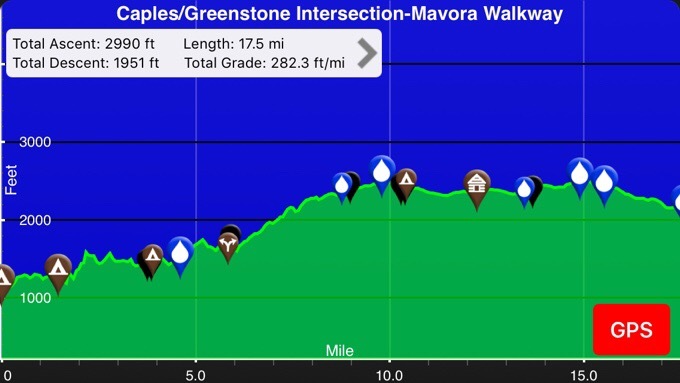 These side trips we did can often have short weather windows, so I recommend that TA hikers interested in them jump on it if it’s clear when they hike through. If weather isn’t clear, then there’s always the option of doing the side trips after the hike. 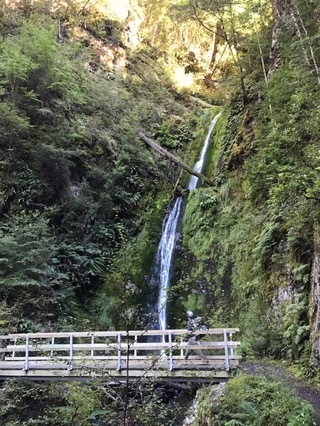 Here’s a list of all the side trips I did on this hike. All except the first two were done during this 11 day pause since Queenstown. Totaled up, that was 110mi/177km the last 11 days and a total of 147mi/237km bonus miles I’ve done of side trips along the TA. I’m really so glad that all these side trips fit in so seamlessly. A lot has to fall into place with timing, weather, and permits, so we feel super fortunate to have gotten to do just about everything on the list of bonus trips that was at the top of the list. I feel fully satisfied. 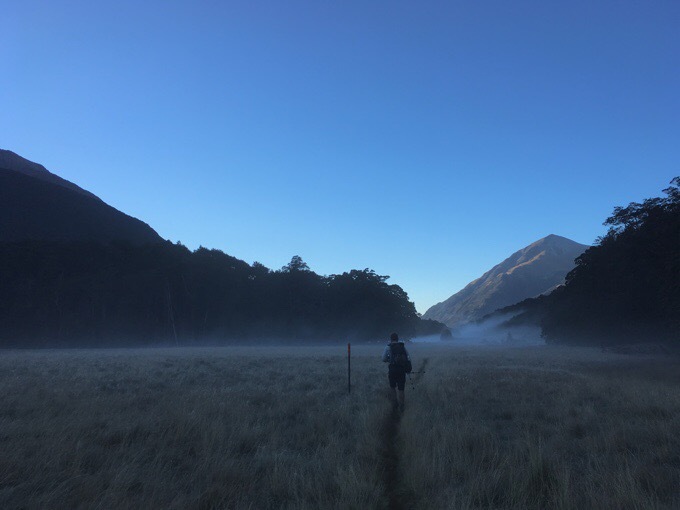 The only things on the maybe list that I didn’t do would be the second half of the Tongariro Northern Circuit (N Island), Milford Track (near impossible to get a permit), Deception Valley on the TA (road walked around when flooded), and a visit to Stewart Island. None of these pull me more than time in Tasmania, so I’m fully satisfied and happy with all I was able to do in New Zealand. Heck, many backpackers that live here their whole life don’t get to do all these tracks and routes. The rest of the day back on the TA was pleasantly uneventful. 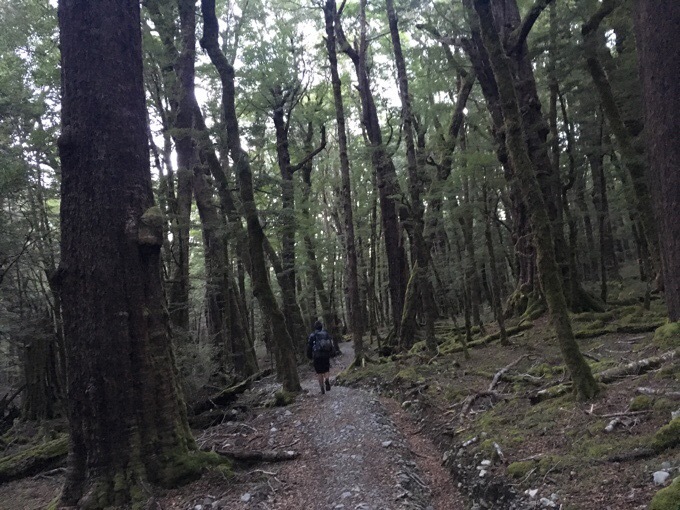 We were on the Greenstone Track until lunch. 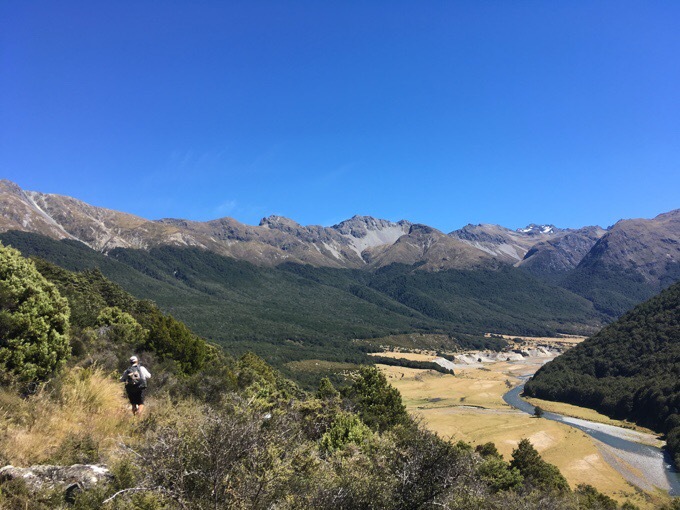 Since it is part of the popular Greenstone/Caples loop we saw a good number of other hikers and got to have lunch at the nice large Greenstone Hut. There are logbooks in the huts, and we are able to see for the first time what TA hikers we are around. There was one father/son duo I knew that we passed today that was fun to catch up with that I last saw back when the weather bomb hit. It seems there aren’t any other sobo hikers within a day of us and there is a bigger group that I overlapped with more the first month two days ahead of us that we may see before we finish. I know many of my friends from the Whanganui River group are just behind within a week. So close! 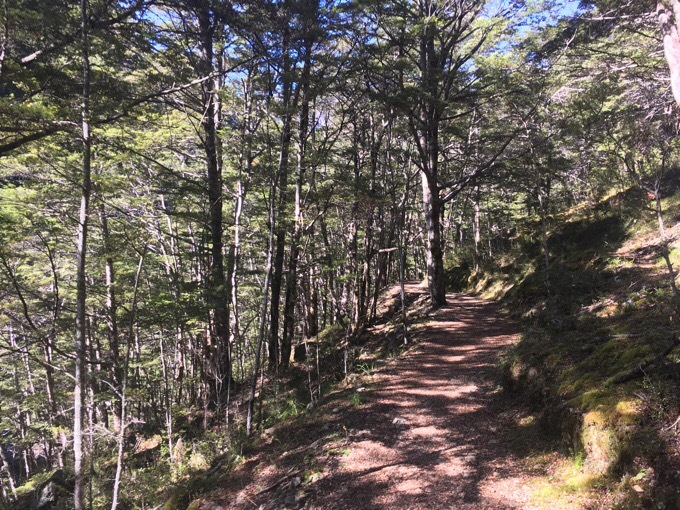 After lunch at the Greenstone Hut, we got on the lesser maintained route of the Mavora Walkway. 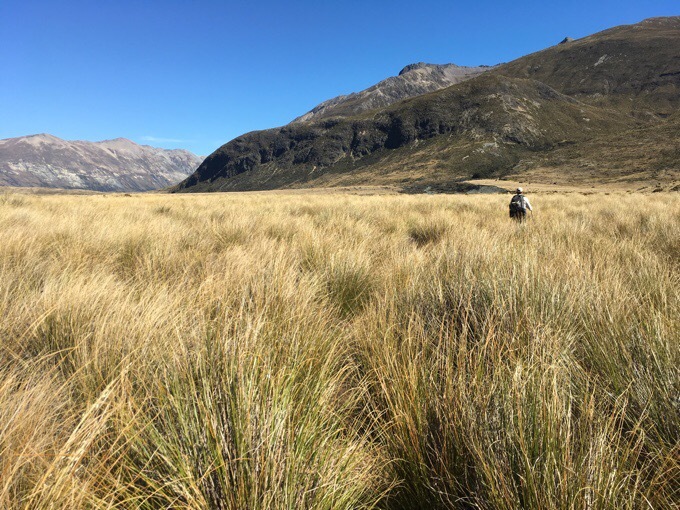 We knew we were back on the TA because we came off the manicured Greenstone Track and onto the mud, roots, and marshy tussock of the Mavora Walkway. Ah, the good ol’ wet muddy shoes for the day. The mud was only in spots here or there, and thankfully, it was drier than it has been. 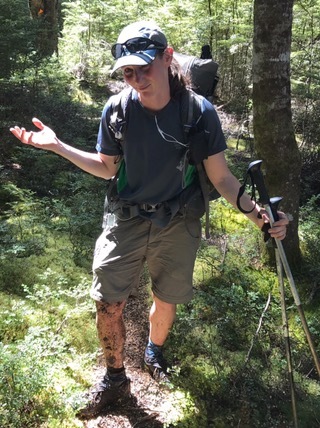 I did manage to step in one spot where the mud sucked my legs down up to my thigh. We joked once again about that “TA tax” we seem to pay daily on the trail in some form. Today, it was in mud and marshy trail. 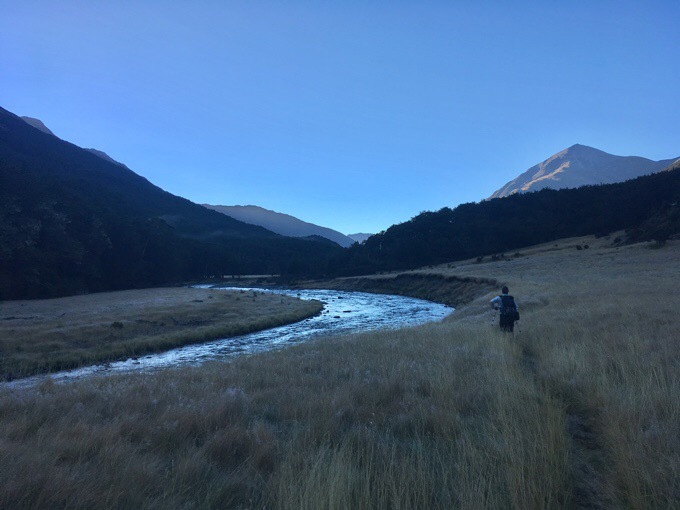 Once out of the woods, and in the tussock, the Mavora Walkway stayed up on the hillside and paralleled the Mararoa River. The valley was beautiful. We stopped at 6:15pm, by a stream to wash off all the mud on our legs, and happy with our distance for the day, which later when totaled ended up being exactly a marathon. I love it when that happens! We have an awesome spot in the valley surrounded by views on all sides and no wind shockingly. I have my doors open and just the screen to block the sandflies, and the view is great. I wish I had a camera that could capture what I can see now that it’s dark. Griggs’s tent is lit up (he’s watching his nightly shows as I write and I’m jealous!) with a clear sky full of bright stars overhead and the silhouette of the mountain in black with a midnight blue color in the sky. The nearby stream has just the right amount of white noise to lull me to sleep as I finish up this post. Just a really nice enjoyable day. I even got to watch 30mins of Greys Anatomy! **A bonus note for the day. Felix finished the TA!!! LOVE this photo! His pack is so damn tiny! Love ya Felix and CONGRATULATIONS!!! Hahaha…they really do look long on the picture. And a little hooray for Griggs and yourself having a good day. 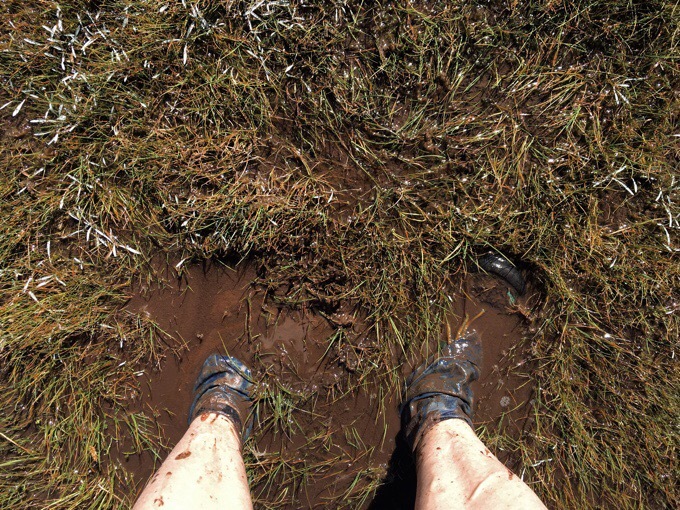 Looks beautiful… Well except for the leg sucking mud. I know I could never toss my pack up in tge air like Felix did, 16 lb base weight and it ain’t getting any smaller. I just saw this now…Thank you Erin. Love you too! It all went way too fast…Hope to see you again sometime. That’s totally possible! The door is always open for a reunion.